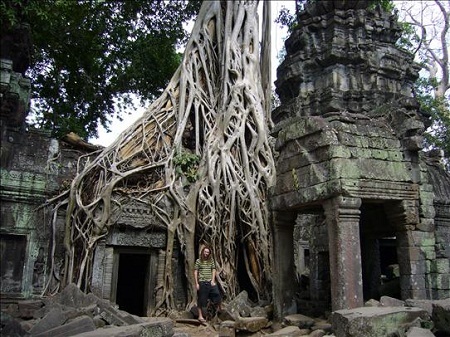 The tourist’s initial impression of Angkor Wat (admission to all of Angkor: 1 day/3 days/1 week US$20/40/60), the last construction of Khmer genius, is simply staggering, matched by only a few select spots on earth such as Peru’s Machu Picchu or Jordan’s Petra. Angkor Wat, one of the most inspired and spectacular monuments ever conceived by the human mind, soars skyward and is surrounded by a moat that would make its European castle counterparts blush. It is a costly mixture of form and function, a mesmerizing memorial to Vishnu, its captivating image replicated in the reflective pools below, a pleasure for unbelieving eyes. Like the other temple-mountains of Angkor, Angkor Wat replicates the spatial universe in miniature. The central tower is Mt Meru, with its surrounding smaller peaks, bounded in turn by continents (the lower courtyards) and the oceans (the moat). The seven-headed naga (mythical serpent) serves as a symbolic rainbow bridge for human being to reach the abode of the gods. Angkor Wat is surrounded by a moat, 190m wide, which forms a giant rectangle measuring 1.5km by 1.3km. Stretching around the outside of the central temple complex is an 800m-long series of astonishing bas-reliefs, designed to be seen in an anticlockwise direction. Rising 31m above the third level (and 55m above the ground) is the central tower, which gives the whole ensemble its sublime unity. Angkor Wat was built by King Suryavaman (r 1112–52), who unified Cambodia and extended Khmer influence across much of mainland Southeast Asia. He also set himself apart religiously from earlier kings by his dedication to the Hindu deity Vishnu, to whom he consecrated the temple – built, coincidentally, around the same time as European Gothic cathedrals such as Notre Dame and Chartres. The upper level of Angkor Wat is once again open to modern pilgrims, but you are only allowed to visit this in maximum 20 minutes.